I have been working these last couple of months with a privately-owned book collection of mostly German books, most of which were published in the late nineteenth and early twentieth centuries, but some of which are a good deal older. The book’s current owner doesn’t read German and has no relationship with the books, so identifying and describing the books has been quite a lot of CSI with just a little of Indiana Jones thrown in. At this stage I think I have a good handle on most of the collection, excepting one particular item. The book is a small black leather bound manuscript stamped “M.G” on the cover, and appears to contain Catholic devotions professionally inscribed in German kurrentschrift (German cursive hand, just close enough to our own handwriting to look familiar but dissimilar enough to defy easy translation) with calligraphic headlines. I don’t know who wrote it, for whom, why, when or where. This inscription is more problematic than it might first appear. 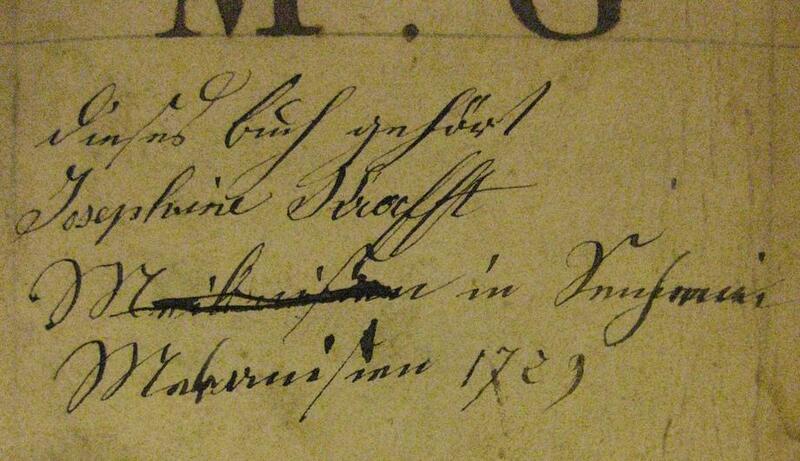 The first two lines read (in German) “This book belongs to Josephine Krofft” followed by two lines of gobbledygook and a date which appears to be 1729. One might hope that this indicates the person the book was written for, her location and perhaps the date she recieved the book. Would that it were so easy. The date is our first and formost problem. Many of the books in this collection are from the 18th century, and so we did take this, at first, to be the date of this book’s creation as well. The trouble began when I started to investigate the book more closely and found that the majority of the book is written on a nice weave paper with a clean, clear watermark depicting the monogram “OHL” with a crown or flame atop the “O”. The watermark is so clean and clear that there can be no question of the paper type. If the paper were lain – the standard paper technology in the early 18th century – you would be able to see, however faintly, chain lines in the paper when held up to a light. Weave paper without chain lines was a technology invented in England around 1757, reaching the Continent even later. If my book reads 1729, it must be back-dated for some reason, as the very paper it is written upon was not invented until 30 years later. Why back-date a book? The answer probably lies in the rest of the text on that line, which I can’t yet decipher. I have one great fear, and that is that the date is a guess made by a previous – but not original – owner. The second puzzle of that inscription involves a lost page. The hasty inscription has been corrected in two places – once where a word was scratched out and written again, below, and once at the end of the third line where one word has been written over another, previously-written word (unfortunately not very visible in this picture). The corrections were so hasty, in fact, that they have left an ink-smudge on the verso of the flyleaf facing it. In between our inscribed half-title page and this ink-smudged flyleaf is a hanging scrap of paper where once there was another page. So, the inscription was made after another page was removed. What was on this missing page? And if Josephine Krofft was the book’s first owner, why would she inscribe it after it has been altered? I suspect now that she isn’t the first owner at all, and the missing page probably had better, more accurate evidence of provenance. Evidence I will never actually witness. Nevertheless the book is an intriguing find. I’m telling you this story now because I hope that somewhere out there someone may be able to help me source this book in some way. If you or anyone you know can read the text of that inscription, can help me identify the paper type or has any other information on 18th (? )-century German Catholic prayer-books, please drop me a line! 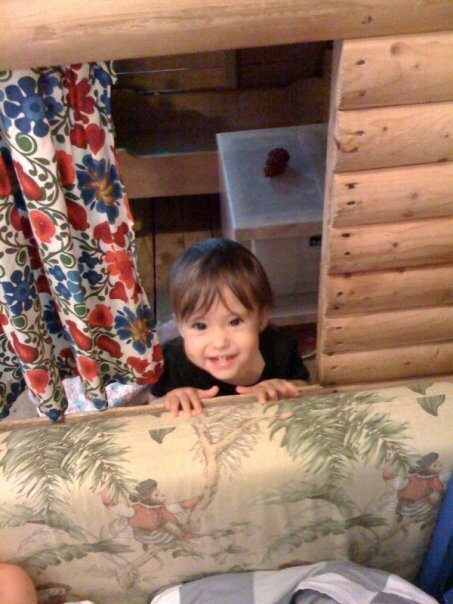 Comment here or email me at charlotte@once-and-future.com. I can provide more photos and information as required.